First off, what’s a command center? Like the NASA Space Command Center that controls all aspects of a space mission, your center is the hub of your family’s life. It’s where anyone can find schedules, calendars, meal plans, shopping lists and so on. Rather than having information scattered all over, or have it be inaccessible in everyone’s tech, create a central place to find out what you need to know about what’s going on with your family. What are the essential parts of a command center? A good location. A room that everyone visits at least once a day. Not the bathroom… The kitchen area is often the best bet but if space doesn’t permit, a nook under the stairs or corner near the entranceway will do! A monthly calendar, preferably set up as a dry erase or chalkboard. Size will depend on how many people’s activities need to be recorded there. You can get fancy with chalkboard paint and an old picture frame, making an eclectic board that will spruce up the space too! A place to leave notes for others, including phone messages or appointment reminders. This can be a cork board, a magnetic board or an extension of the dry erase board. This is a great place to post the weekly meal plan and an ongoing shopping list. If someone in the family suddenly realizes that you’re all out of popcorn, they can add it to the list! Inboxes. This can be one big in box or one per person, depending on how much space you have. Wall hung folder holders are a great way to manage this for multiple people. All paperwork from school or activities, forms and other info goes from the backpack to the appropriate inbox RIGHT AWAY. This will take practice but the kids will get there! Set up some rules around what goes into or is left at the command center and what should be taken away. Lunch bags and backpacks? NO. Letter from the school or permission forms? YES. Book to be returned to the library? NO (but put a note of the due date on the calendar if you need a reminder!) The stack of junk mail that just came through the slot? NO. The visa bill? YES. Make rules that work for your family. For example, you might decide that you would in fact prefer backpacks to end up at the command center, so that you can check agendas, or for rogue food particles! If so, make sure you create a way to store them so they’re not just flung on the table or floor. Hooks under your command center table, for example? 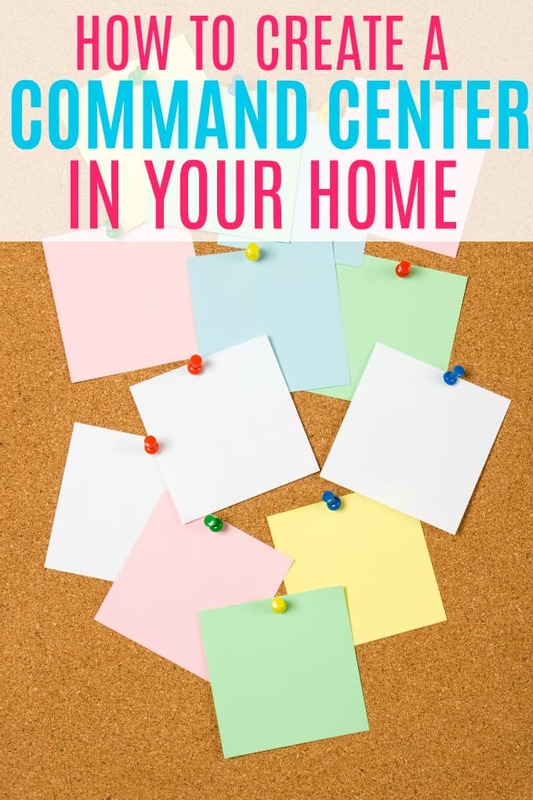 Make it a routine to go through the paperwork filed in the command center regularly and throw out what is no longer needed or file what should be kept on a digital scan or in a filing cabinet elsewhere in the house. One excellent tip is to colour code your filing system, so you can put your hand on what you’re looking for more quickly. Files that are school related are blue. Recipes and food information is red. After school / extracurricular activities are green. You can get sticky notes to match each so that you can at a glance see what’s what. Alternatively, you could give each person a different colour, including the household in general. Whatever works for your family is best! For younger children, you might have a daily schedule to remind them ‘what’s next!’, which makes it easier to transition them throughout the day. For older kids, you need a monthly calendar to be sure that everyone knows when Timmy’s soccer finals are and so that no one books an outing for themselves during Aunt Mira’s 80th birthday party. Also, so that someone thinks to go get a gift for Aunt Mira! These days, a lot of kids have tech, but keeping these in the bedroom at night is a bad idea. It’s distracting and can actually interfere with sleep patterns. Instead, set some tech rules so that everyone’s phone or tablet needs to be at the gadget station by X o’clock every night. Keeping the gadgets in the command center allows you to do a quick visual sweep in the evening, to make sure everyone’s is there. Yours too! Coordinating colours with your kitchen, or whatever room your center is in, can be a lot of fun! There are some lovely stationery collections with gorgeous patterns and lively colours that will look great! There’s no need for a command center to look like an office: it can be light and creative too! Now go out there and get organized! It’s a task to get it all set up but once you’re up and running, you’ll wonder why you didn’t do this sooner! You might also like an Erin Condren planner. See how to organize user manuals. What fantastic ideas, luckily there’s only me here so I don’t need a command centre, however Iove the idea of the monthly calendar set up as a dry erase or chalkboard and an old picture frame, this would definitely spruce up the space too! Been using something similar for years, my mom did it, we have two main centres with two boards, it’s working well.